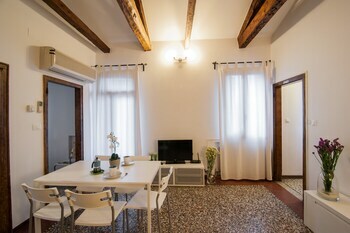 With a stay at this apartment in Venice (Castello), you'll be a 4-minute walk from Basilica di San Giovanni e Paolo and 11 minutes by foot from St. Mark's Basilica. Located in Rovereto, Colle Ameno Room & Breakfast is a 1-minute drive from Lagarina Valley and 6 minutes from Rovereto Civic Museum. Free self parking is available onsite. Located in Chiusi, Hotel Ismaele is a 1-minute drive from Val di Chiana and 9 minutes from Chiusi Cathedral. With a stay at this apartment, you'll be centrally located in Rome, steps from Campo de' Fiori and 13 minutes by foot from Spanish Steps. With a stay at Trappitu dei Settimi in Diso, you'll be within a 10-minute drive of Castro Marina and Grotta Verde. Free self parking is available onsite.